The crest of the Furness Bermuda Line, as used on the ships’ lifeboats. 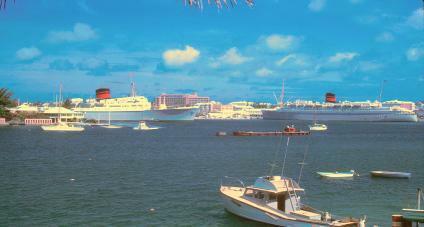 Ocean Monarch joining Queen of Bermuda in Hamilton harbour, Bermuda c. 1965. Some of the material used may be copyright © Furness Group Archives and is reproduced here by kind permission of Sir Richard Alexander, Bt, Furness Group Consultant Archivist and Historian. All other material is copyright © www.furnessbermudaline.com, unless otherwise stated. 1. Furness Bermuda Line and two pairs of Sisters - by Allen Soares - click here. 2. For news of changes at the FBL Association and this website - click here. A Grand Reunion to mark the 50th Anniversary of the end of Furness Bermuda Line was held at Care Ashore (right) on Saturday 14 May 2016.